This article submitted by Michael Jacobson on 9/1/99. Among the students and staff returning to the school hallways in Paynesville today, no one has seen as many first days of school as high school English teacher Richard Butler. Mr. Butler, entering his 40th year of teaching, has more first-day-of-school experience than three high school seniors combined. He started teaching in Paynesville in the 1960-61 school year and is still going strong. These days, new faces for Butler are found not only in the halls but in the staff room as well. Among current teachers, he has the longest service to the school district by five years. The hardest part of returning to school, he said, is organizing his room. The best part is the enthusiasm and the sense of a new beginning. "Sometimes I think it's one more opportunity to get it right," Butler said, of returning to teach for another year. "One of these years I'm going to get it right." Altering his teaching every year keeps his job fun, fresh, and challenging. While some subjects have a logical sequence that leads to a set structure, "I've never felt that about English," said Butler. "Literature and writing defy characterization. It's impossible to establish a rigid or even semi-rigid plan to use every year." Setting a new schedule each year can be frustrating, but the challenge makes each year rewarding. "My subject has never allowed me much comfort," he added. "You've got to be on your toes." After almost 40 years, Butler knows that the optimistic feelings and enthusiasm of the first day will wane as the year goes by. Even after reality sets in, as he calls it, he enjoys his job. "I like being at school. I've always liked being at school," he said. "I like being around books. I like being around teachers and learners," he added. He even loves the smell of schools. He preferred the smell of his first classroom in Paynesville, the one next to the library on the third floor of the old high school. He remembers fondly the smell of fresh varnish in that school every fall. When the current high school was built 30 years ago, Butler moved to his present classroom. The old high school, with his first classroom, was used as a middle school building for 20 years before being torn down in the early 1990s. "Generally speaking, by the end of August, I'm ready to go back. Every May, I'm ready for a break and to get away from it," Butler said. Teaching hasn't become easier with nearly 40 years of experience. "I know more than I did, and I've got more material, mostly because I'm a pack rat," he admitted. "In a lot of ways, it was simpler in those early days," he added. He didn't feel that students themselves had changed very much. He said they were neither smarter nor less smart than their predecessors. "I think the kids are busier these days,"ÊButler explained, "and more mobile." More kids holding jobs and working longer hours. More athletic programs. More activities outside of school. "You've got such competition for the student's time, homework time, reading time,"Êhe added. "In that sense, it makes teaching more challenging than it ever was," he added. Butler believes in the importance of a broad-based education and in making learning enjoyable. "I think the real challenge is communicating that none of us know it all,"Êhe said. "When you think you know it all, it's time to leave school." So, when will he be leaving school? "I used to joke that I'd stay until I became an institution, or belonged in one,"Êhe said. He fairly sure he will teach another two years and may keep at it for four more years. "When it stops being fun, when it stops being a challenge, I'm out of here,"Êhe declared. "Right now, I like what I'm doing." After he completes this school year, Butler will match Ruth Wunderlich's 40 years of teaching in our local school system, which could be a record. 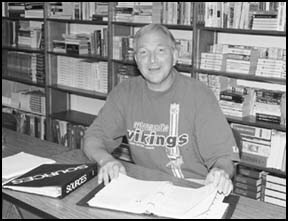 Wunderlich taught three years elsewhere as well. One scary prospect for Butler is that sometime soon he may teach a third generation in the same family. When Butler started teaching in Paynesville, he had an experienced colleague named Agnes Dreis, who taught 38 years in Paynesville and 47 years total, according to the school district records. "I'll never make it," he responded to the possibility of teaching as long as Dreis. "I'm close," he added.